Where will the iPod be in three decades? A Sony Walkman from the '90s. The device is celebrating its 30th birthday. If you're of a certain age, you remember your first Walkman. The Sony portable music player was, at the time, a mark of cool. You could, after all, listen to your tapes while you walked. In later versions, even the radio was your friend wherever you went. No boombox necessary, the Walkman would go everywhere you did, and all you needed was a pocket, and your headphones. With its introduction 30 years ago today, the Walkman also ushered in a new set of advertisements: Remember all that lycra? The leotards? How about the songs that you couldn't possibly get out of your head? Sound familiar? The Walkman was, in so many ways, the precursor to the MP3 explosion, and the iPod dominance we see now. 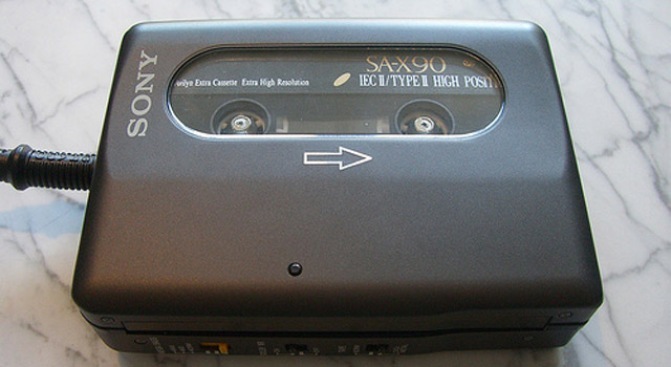 After all, Apple's ubiquitous device was hardly the first to put music in your pocket. It just gave you a lot more to walk around with. It wasn't the first to show cool, cutting edge commercials for its product. It just updated the art. Remember the monkey? The kids and their "First Sony?" And, did I mention the woman in the leotard? The big story in all of this for Sony is that the company that had a huge head start on all this portable music stuff is now struggling. For some reason, Sony, after dominating Act One, froze up when the curtain re-opened, completely blowing off the new market, and the tens of millions of music lovers wanting to go to the next level. It's pretty much ceded the portable music market to Apple, and even posted a billion dollar loss for the most recent fiscal year. Apple, on the other hand, has paid tribute to Sony every step of the way, as it's all but crushed its Japanese rival. The iPod gave way to several new variants, and you can even take your music with you on its latest gadget, the iPhone. The company is firing on all cylinders now, which begs the question: Where will Apple, its devices, and its shady chromatic ads be in three decades? The guess here is that everything will look different, and there will be some new players for sure, but I don't see Apple pulling a Sony. Yes, there will be bumps in the road for the Cupertino company, as there have been in the past. But, no matter who's in charge, I don't see Apple missing the next round (or decades) of portable music technology. There will be others more nimble and even cool, but Apple will still be in the game. Eventually, I'm sure this generation will wax poetic about their first iPods. Remember the Nano? Remember Jet and "Are You Gonna Go My Way?" Whoa, you still have that U2 version? Cool. Now, check this out.